Today I want to share with you a short video (only about 3 minutes!) about how a Search Engine works. After watching it, you’ll have a basic, technical explanation of how Search Engines discover and index your website. Understanding how search engines work will give anybody with an interest in Seach Engine Optimization a better sense of how SEO works and a better idea of what to expect when doing SEO on their own site. I often say SEO takes time. It’s because when you do a web search, the results you get back are not exactly current. They are only a snapshot of what Google has indexed up to that point in time. When you make a change to your SEO – whether on or off the page – it takes time for search crawlers to navigate back to your page and index those changes. That’s why when you commit to doing SEO, patience is a virtue. It’s not uncommon for weeks (or even months!) to go by without seeing the effects of your hard work take place. However, there is one thing that can supercharge this process and that’s links. It’s links that allow the search spider to crawl and index the entire web; links act like the threads of a web that the spiders use to get from page to page. When a link is directed to your page, a thread is created and available for the search spider to crawl. The more links, or threads, pointing to your page, the better. Links pointing to your website or a page of your site are like votes of confidence in favor of your site. The more links pointing to your site, the more confidence Google and other search engines have in your website and the more willing they are to crawl and index your site. As trust in your website goes up, so do your rankings. 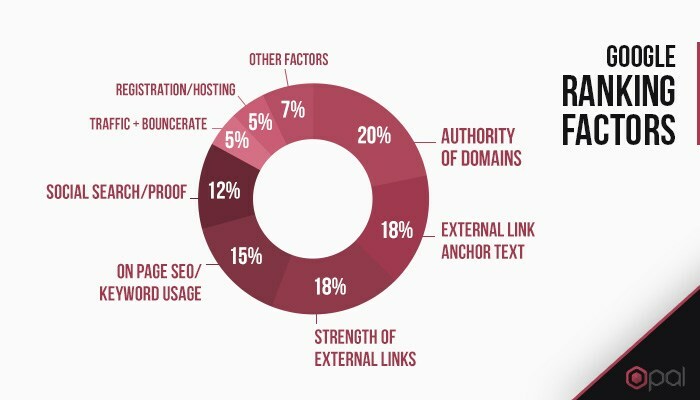 Some links will improve the SEO of your website while others may end up hurting it. Google has created its own system, PageRank, for evaluating the confidence of a page on the web. Essentially, PageRank boils down to two factors: Authority and Relevance. Let’s say your website sells medical supplies. If you acquire a link from a Frozen Yogurt blog, that link isn’t going to mean as much to Google as it would if the link came from a well-established organization in the medical field. That’s because a blog about Frozen Yogurt isn’t relevant to your medical supplies website. The other big thing to consider is the authority or “trust-factor” of the site that is linking to you. Google does a pretty good job of displaying authoritative sites in its search results. These are sites that have earned a lot of votes, in the way of links and can be trusted to provide users with quality information. A link from a site that has a low trust-factor or low authority – in the eyes of Google – is not going to pack as big a punch as alink from a high-authority website would, and can even be viewed as spam, which can have negative impacts on your search rankings. You can think of links as a sort of weighted democracy where some links carry more importance than others. Websites with fewer links are seen as less important and receive less attention from Google and other search engines. Websites with more authoritative and relevant links pointing to it will do better in Search and receive more love from Google and other Search Engines in the form of crawl frequency and speed of indexing. When you search for a keyword, search engines scan through their index of the web and look for the appearance of that keyword. Google, as a search engine, uses over 200 rankings factors to decide on which content to show to its users. It looks at things like the Page Title and the URL; it scans the content for how many contextually similar words, or LSI keywords, appear in the body; it also looks at how relevant the web page is in relation to the search query. A big part of SEO is optimizing how and where a keyword is used on the page. Knowing which keywords to target and where to implement them directly affects how your web page will appear in the search results. Things like the Page Title and Meta Description can have an instant effect on your web page’s appearance in Search and can immediately affect rank-boosting factors like Click-Through Rate, a pivotal metric used by RankBrain, Google’s third-most important ranking factor. On-page SEO plays a significant role in Google’s index. It’s how Google ties your webpage to certain search terms and is critical in appearing for the keywords you want to rank for. I love Google’s commitment to quality and impartial search results. To me, it’s their ethics and values that make Google what they are. On that note, I want to quickly talk about White-Hat and Black-Hat SEO. Simply put, White-Hat SEO is the practice of doing Search Engine Optimization in a way that is in-line with Google’s quality guidelines. It’s an ethical, above-board way of doing SEO. Black-Hat, on the other hand, is not. When you do SEO in a dishonest way, you risk being penalized by Google and other Search Engines. These penalties can mean a drastic drop in rankings or being removed from the index altogether. You can think of Black-Hat SEO as the quick-fix, instant gratification way of doing SEO. In other words, it’s an attempt to game the system to achieve better results faster. When you do White-Hat SEO, you aren’t at risk of being penalized by Google or other Search Engines. In addition, Search Engines have gotten a lot smarter over the years and these dubious Black-Hat SEO tactics no longer work and, frankly, aren’t worth doing. In case there was any doubt, Peak Websites only executes White-Hat SEO strategies and best practices. We have seen first-hand that by doing things the right away, the results will come naturally. I hope that gives you a better overview of how Search Engines work as well as an introduction to SEO and some of its basic principles. Of course, feel free to contact me if you have any questions or leave a comment below.